On March 14, 1935 the funeral procession of Ruan Lingyu reached over 5 kilometers in length, with a crowd of over 300,000 mourners taking to the city streets to pay their respects. The Shanghainese silent film star had taken her own life at the age of just 24. 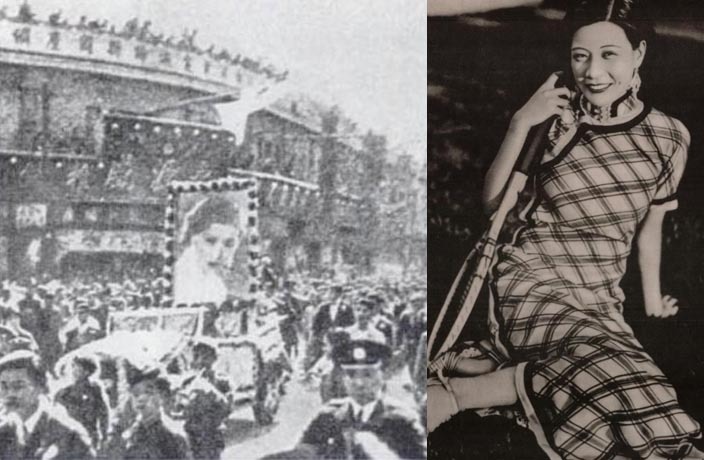 The procession was reported to be larger than an emperor’s, and the New York Times called it “the most spectacular funeral of the century.” Shockingly, three women actually killed themselves during the event. Born to a working class family in 1910, Ruan’s father died when she was young, and at just 16 she signed for the prominent Mingxing Film Studio. She went on to make a string of successful films, including 1934’s The Goddess, hailed as the pinnacle of Chinese silent cinema, in which she sympathetically portrayed a prostitute bringing up a child. Later that year, Ruan made her penultimate film, New Women, where she played an educated Shanghai woman forced to death by an unfeeling society. In a case of life imitating art, following the films completion Ruan’s life began to unravel. Due to their scathing depiction of the movie, the Shanghai tabloid press became extremely hostile, seizing on Ruan’s private life and a lawsuit with her first husband, Zhang Damin, a spendthrift and chronic gambler. Relations with her second husband, tea tycoon Tang Jishan, were also deteriorating; Tang was abusive, and is believed to have beaten her on the night of her suicide. It was all too much for Ruan, who poisoned herself with an overdose of barbiturates.